1 - nightshirt/s $32.90 ea. 2 - nightshirt/s $30.90 ea. New! 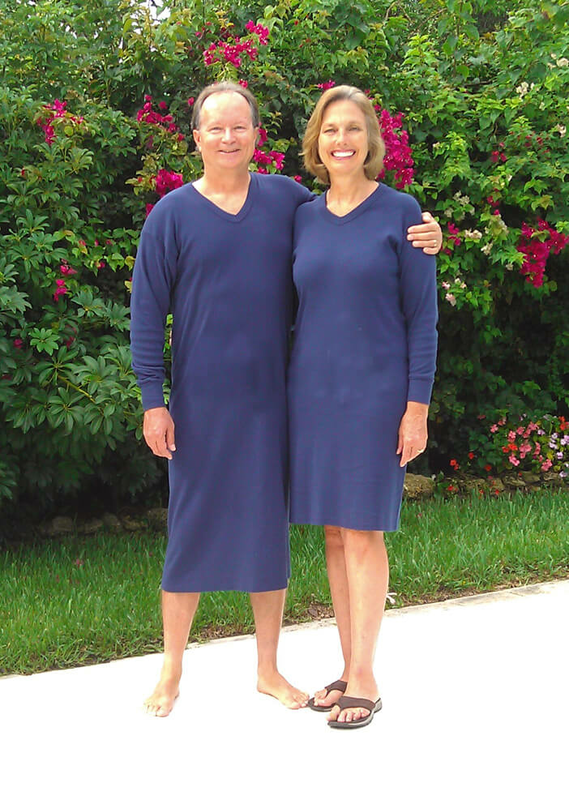 Long Sleeve V-Neck Tee-PJ™ now available in Regular 45 inch or Long 55 inch lengths in the color navy only. Made with the same ultra-soft Premium Combed Ring-spun 100% Cotton knit as the Original Tee-PJ™ nightshirt. Please use the size chart tab for best fit. Have a favorite old nightshirt or shirt? Measure the width at the widest part and then compare with the width measurement provided below in our chart for a perfect fit. We find your size is usually at least one size larger than you would wear in a t-shirt - circular knit sizing instead of t-shirt sizing. Machine wash/dry; no bleach, no hot water - durable and will last several years. Quality made in the USA by Union labor. Please note - the long sleeve has a cuff at the bottom of the sleeve. Please order at least one size larger than you normally wear for a t-shirt or use the size chart tab for best fit. You efforts will be rewarded with our most durable and soft cotton knit fabric that moves when you move for the ultimate in comfort. This style is not advertised, prices are as stated. Need Pocket Material? Tee-PJ™ nightshirts do not have pockets, but we can send you pocket material. Just call us 800-890-7232 when placing an order and let us know what size pocket you need and we'll be glad to send you the matching material. Length is measured from the back of the neck to the bottom of the nightshirt hem. Important Pricing Note: Long sleeve style in V-neck is available only in navy color. It is $2 more per nightshirt for the 3XL style. The Long 55 inch Length is $7 more per nightshirt. So, the 3XL in long length is $9 more per nightshirt. Please note - the long sleeve has a cuff at the bottom of the sleeve. If you would like to order a soft blue or white color in the long sleeve, this option is only available in the crew neck 45 inch(4XL/5XL sizing not available in 45 in.) or the crew neck 55 inch(4XL/5XL comes in blue only in 55 in. ).